On Brooklyn Nine-Nine, Andy Samberg plays the talented but immature detective Jake Peralta. Fox’s Brooklyn Nine-Nine is giving me a complex. The half-hour comedy revolving around antics at a New York Police Department precinct is sharp, funny, creative, and filled with great actors—all of the things I love. Policing, however, is in crisis. And any pop culture exploration of law enforcement has to take on the issue of systemic racism and violence in the police force or or it’s going to ring hollow—and comedies don’t get passes on tackling the serious stuff. I hope the moment we have all been waiting for is nearly upon us and that this season, Brooklyn Nine-Nine will maintain its irreverent and snappy sense of humor while also going where it should have trod long ago: focusing a plotline on Black Lives Matter and other social justice groups fighting for police reform. At this point, it’s painfully obvious that the show either can’t figure out how to address the problems with law enforcement in America, or it doesn’t want to, which is a grim thought. In a show that revolves around modern policing, set in the heart of New York City, not admitting that the police have a problem is a problem. From the start, Brooklyn Nine-Nine’s cast has been more diverse than the norm in television, with a solid race and gender balance, though it still slants male and white. The show hasn’t hesitated to take on issues like what it’s like to be a Black gay man on the force, and it’s dabbled in and out of social questions that are certainly occupying the minds of viewers. 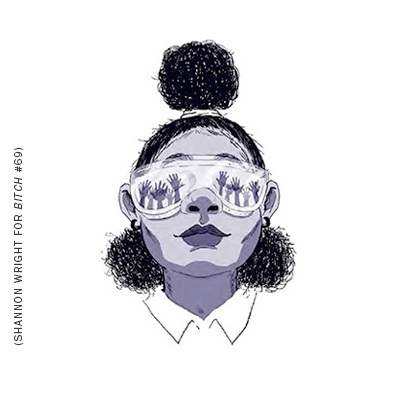 It illustrates that it’s possible to be screamingly funny while also acknowledging that things are happening in the world and people care about them, which is a rare combination. Andre Braugher plays Captain Ray Holt on Brooklyn Nine-Nine. Most police shows airing at the moment are dramas, many opting for the gritty, dark elements they think viewers want to see, complete with ripped-from-the-headlines storylines. Policing comedies are usually buddy cop stories, and they’re more common in film than television. A true ensemble comedy revolving around law enforcement is an incredibly rare beast, and it’s hard to do well. Brooklyn Nine-Nine has found the sweet spot, the balance between serious storylines and comedy. It’s difficult to be a comedy that also touches on social issues without coming across as preachy, and plenty of television has fallen into this trap in the past. Either it’s a “very special episode” that glaringly doesn’t fit with the aesthetic and ethos of the rest of the show, or it’s a series of hamfisted plots that feel like they’re being shoved down the throats of viewers. Brooklyn Nine-Nine’s creators understand that the only way to find a balance is to embed a social lens from the outset, whether it’s through silently illustrating that a cast can be diverse without the world coming to an end or vindicating geek girls across the world. So how can the show completely skate over one of the biggest challenges facing American law enforcement? Yes, the show is filled with pratfalls and dorkiness and charming ineptitude, but it usually manages to keep that humor punching up rather than down. But that’s also where the show starts to stumble: Our heroes are all good, earnest cops who catch bad guys and always do the right thing—it’s Mayberry for the urban 21st century. Crooked cops are almost cartoonishly so, painted in bold strokes as obviously bad apples. There’s no exploration of the subtler forces at work in American law enforcement, of the biases that plague officers and shape the ways they interact with the public. 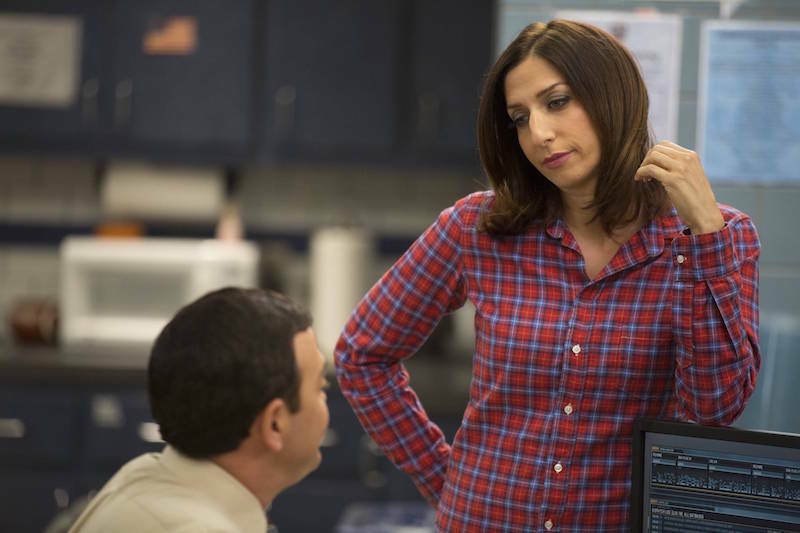 Chelsea Peretti plays the station’s sardonic civilian administrator Gina Linetti. 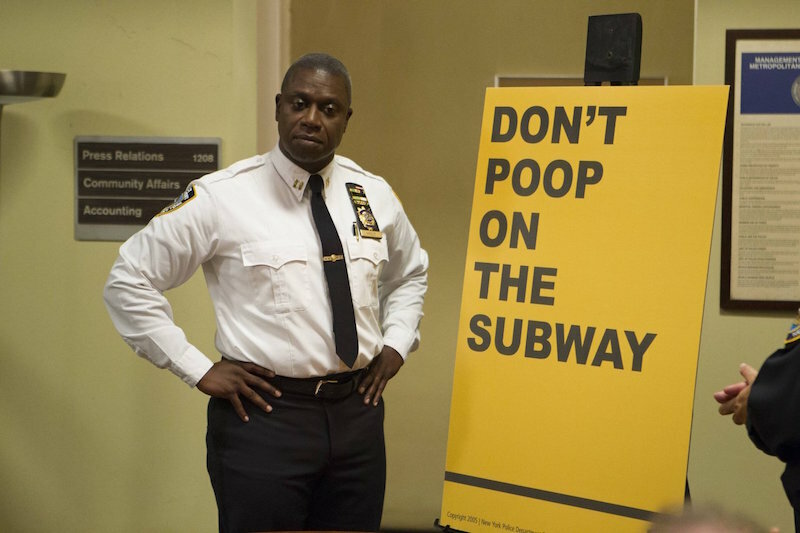 This is a show set deep within the insular world of policing, and the only time it really delves into the significant tension and conflict between law enforcement and civilians is in a B storyline where posters promoting the NYPD are vandalized on the subway. Even then, the vandalism is juvenile and the kind of inane, middle school–level stuff that makes the vandals look petty. It’s disturbing that in the one moment when the show actually explores public perceptions of law enforcement, it turns negative perceptions into a joke that no one really takes seriously, as though activism demanding better policing is equivalent to drawing a mustache on a poster of a cop. The creators seem to have stumbled into the belief that acknowledging the policing problem in America will turn the show into a political organ, leaching it of comedy. For those setting out to make the world a funnier place, the thought of becoming unfun by introducing a “downer” is unacceptable—so Brooklyn Nine-Nine continues skating along the surface, going for some of the easier laughs, while leaving what it perceives as the third rail alone. Turning race into a third rail is one of the things that has made it so difficult to address systemic racism in America, though. As soon as white viewers brand race as something dangerous that can’t be talked about without bringing people down, or something that only people of color should be talking about, we collectively absolve ourselves of responsibility for doing anything about it. White creators and cast members have to be careful about how they handle race, but the solution to that problem isn’t to simply ignore it and hope that no one will notice. Believe me. We’re noticing. Is Brooklyn Nine-Nine afraid of alienating viewers or the network? Are the creators afraid of doing it wrong and perpetrating more harm than good in attempts to bring up some of the most pressing problems facing American law enforcement? The presentation of a fantasy world in which these things aren’t problems just because this is comedy and everyone is having a cool and fun time isn’t working, and creators who have taken on so many social challenges before shouldn’t be shying away from taking on some of the biggest problems we face. Brooklyn Nine-Nine would be stronger for it—and dare I say, it might also be funnier. Comedian Jenny Yang talks about how to "befriend your fears" and get onstage.